After a successful opener featuring TV and movie themes in November, pianist Tony Hagood’s 2018-2019 Jazz at the MAC series returns in the new year with a nuanced look at a true jazz master. “Tony Hagood Presents The Music of Horace Silver” takes place at the McConnell Arts Center in Worthington on Friday, January 25th at 7:30pm – tickets are available here. Hagood has once again assembled a top-notch ensemble for his next concert, as his quintet will feature Anthony Stanco on trumpet, Michael Cox on tenor saxophone, Reggie Jackson on drums, and Bradley Mellen on bass. Hagood was very kind to answer my questions about Silver, the concert and the band, so keep reading to learn much more about this excellent show. I’m excited that your next concert will tackle the music of Horace Silver. For the uninitiated, what aspects of his music and your presentation do you think will be particularly enjoyable for the local jazz audience? Tony Hagood (TH): I personally find Horace’s music to be very catchy. Sometimes I get some of his compositions stuck in my head. To me, Horace’s music is the perfect combination of complex harmonic movement, chromatic unexpected lines, and beautiful memorable melodic melodies. Could you share your feelings on what Silver contributed to the world of jazz, and how he has impacted your style? TH: Horace Silver started his career as a bebop pianist. I enjoy bebop but it is not often very accessible to the uninitiated. Horace was one of the pioneers that took elements from Bebop and blended them with elements from previous genres that emphasized singable, tuneful melodies to create a new genre: hard bop. I studied a couple of Horace’s compositions in college. We even learned one of his tunes by ear in Fusion Band my freshman year. It was great to be able to hear the melody and figure it out on the piano. THEN I went back and checked out some of the harmony and some of things Horace was doing on the piano and it really blew my mind as a young musician. On the surface the music sounds simple, but there is really a lot of stuff going on underneath it all. In addition to giving the world Hard Bop, he is one of the most active compers I have ever heard. His constant acCOMPaniment helps continually push his music forward which makes it sound and feel exhilarating. Lastly, Horace’s compositions are just so memorable. Even today, many of his compositions are standards among jazz musicians. While studying at Capital I came across a Horace tune I liked. The professor I shared it with hadn’t heard it before and exclaimed, “There he goes again. Another earworm.” So much of what Horace wrote became an immediate memorable hit. Even though that professor was well versed in Horace Silver’s work, they didn’t know this particular composition but it was a composition that immediately resonated with them. How did you go about choosing tunes from Silver’s deep songbook? TH: When I am picking tunes for these themed concert series, I try to make sure to include some of the hits like “Song For My Father,” “Doodlin’,” “The Preacher,” “Sister Sadie” while also picking tunes that I don’t know as well but still resonate with me like “Diggin’ on Dexter,” “Pretty Eyes,” “Quicksilver,” “St. Vitus Dance,” and balancing them all by choosing compositions with contrasting keys, modes, tempos, and styles to keep the concert interesting and moving forward. Has any of the material you selected presented any particular challenges or opportunities during your preparations so far? TH: Learning from any of the jazz masters presents challenges because of the vast amount of material there is to go through and learn from over the period of each of their respective lives. For Horace’s music, which is true of lots of the masters, one of the challenges is understanding, hearing, and emulating the idiosyncrasies of his playing and compositional style. As mentioned previously, Horace likes to create forward momentum by comping most of the time. He also likes to create tension and resolve that tension by using passing tones and passing chords in his voicings. Sometimes it is hard to hear exactly what he is doing due to the quality of a recording or the volume of the piano compared to the other instruments on the recording. Thankfully some of this can be solved with historic video clips which is why video streaming services like YouTube are so valuable from an education perspective. Tell us about the members of your band for this show. I am excited about working with these great local musicians. Columbus is really lucky to have such talent! In short, each of these musicians is already at the top of their respective fields. Putting together a concert of Horace Silver’s music becomes so much more than making sure everyone is playing the right notes at the right time. Don’t get me wrong, we definitely spend some time making sure a hit or run is the way it’s supposed to be but we also get to do so much more. We get to create music by focusing on the mood and emotion of a piece. Working with each of these professionals helps to elevate each other to another level of music which in turn elevates the audience’s perception and enjoyment. Anthony Stanco – Born in Southeast Michigan, raised in the Blues and Soul mecca of Detroit, and tutored by the community’s finest (Rodney Whitaker, Marcus Belgrave), Stanco joins a generation of jazz musicians that both reveres the roots of the music and energetically seeks its future. With a big, brilliant sound and a fearless command of the horn, Stanco brings to mind such trumpet greats as Louis Armstrong and Dizzy Gillespie. Stanco’s band (five young men known as The Crucial Elements) has built a livelihood touring the world repeatedly as intercultural ambassadors through the US State Department’s “American Music Abroad” program. They consistently receive rave reviews about their engaging live performances and equally captivating record titled “The Crucial Elements.” When not touring he teaches at The Ohio State University and Oakland University in Rochester, Michigan. Dr. Michael Cox – In addition to teaching full-time at Capital University as the Saxophone instructor, he has maintained a busy local performance schedule as a member of the Columbus Jazz Orchestra, High Street Stompers, Flippo the Band, the Black Swamp Saxophone Quartet, and is also on call with the Columbus Symphony, Pro Musica Chamber Orchestra, and several other groups. Michael’s second jazz recording as a leader (Compassion, CoJazz CJ-1047) features Gary Versace (piano & organ), Buster Williams (bass), Stan Smith (guitar) and Matt Wilson (drums), and was released January 21, 2018 [JazzColumbus review]. Tony Hagood is an internationally accomplished pianist, composer, arranger. He is also the band leader for the Tony Hagood Presents! Jazz at the MAC series. Tony holds a Bachelor of Music degree from Capital University with emphasis in performance. He has played for audiences in China, Japan, South Korea, France, Italy, Spain, Turkey, and many countries in the Caribbean. Here in the states, he plays for a large range of performances from restaurants to stadiums. When Tony is not performing with other bands or leading various versions of his trio, he works as a staff accompanist at Otterbein for Concert Choir and various other groups, accompanies Westerville South High School, and Pickerington Community Choirs, and is the Music Director and pianist at the Triumphant Church of God in Westerville on Sundays at 10:00am. Tony also runs and teaches for his music lessons company, Noteworthy Music, which provides lessons in students homes across central Ohio. Bassist and cellist Bradley Mellen has been an active member of the Columbus, Ohio music scene for over a decade. His lyrical, inquisitive approach to both bass lines and melodies, combined with his versatility and wide-ranging interests, have kept him working with a great variety of musical projects in that time. 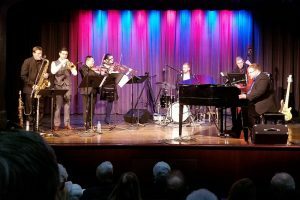 Recent appearances have included recurring engagements with virtuoso pianist Tony Hagood, fusion jazz guitarist Alex Schrock, international vocalist Laura Camara, Ohio State University director of Jazz Studies Shawn Wallace, and Latin-jazz group Clave Sonic. Other associations have included adding his musical voice to the unique world-jazz-fusion of Hans Utter’s Chakra, navigating the challenging original compositions of Ken Messer’s Phoenix Project, accompanying local vocalist favorites Dwight Lenox and Brian Smith, and filling in with the adventurous Mark Lomax Trio, amongst many others. He has also occasionally appeared with his own group, the Brad Mellen Quartet, with which he often explores his interest in re-envisioning compelling tunes from soundtracks, popular artists, and other sources in a jazz setting, as well as performing some of his own compositions. Bradley holds a Bachelor’s degree in composition and jazz studies from the Ohio State University, and a Master’s degree in jazz performance from Purchase College in New York. Reggie Jackson, a Columbus, Ohio, native, is a graduate of The Ohio State University with a bachelor’s degree in Jazz Studies. In college, the drummer began working with recording artist Kim Pensyl. Shortly after graduation, Reggie began his 11-year tenure with two-time Grammy winner and jazz legend Diane Schuur, as well as a short stint with Aftermath recording artist Truth Hurts. He’s also toured with Rock-n-Roll Hall of Fame inductee, and 6 time grammy winner Dr John. In addition to these artists, Reggie has also preformed with Frank Foster, Benny Golson, Arturo Sandoval, Eddie Daniels, Anthony Hamilton, Terence Blanchard, Kirk Whalum, Nicholas Payton, Wycliffe Gordon, Wendell Brunious, Rodney Whitaker, Marcus Belgrave, Lew Tabackin, Dee Dee Bridgewater, Chuck Loeb, Nelson Rangel and Antonio Hart. The versatile drummer has performed on the “The Tonight Show,” played in over 25 countries, and can be heard on recordings ranging from jazz to hip-hop, gospel, classical, and R&B.